100ml Plastic Sphere Bottle with our glossy look silver and black lotion pump. The bottle is made from quality PET plastic, which is 100% recyclable, lightweight and shatterproof, great if you’re planning to post your products. If you're looking to gain the edge over your competitors then our NEW Sphere Bottles could provide you with just that. 100ml capacity and made from quality crystal clear PET plastic. This allows the natural beauty of the product within to penetrate through. 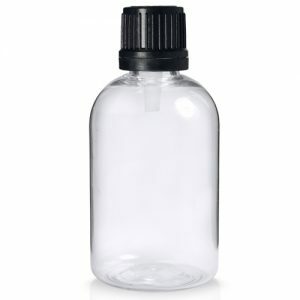 Compatible with many closures types, makes this bottle a must for your bath and beauty products! 100ml Plastic Sphere Bottle with our glossy look lotion pump. The bottle is made from quality PET plastic, which is 100% recyclable, lightweight and shatterproof, great if you’re planning to post your products. A great packaging choice for a range of products where the product consistency is too thick to pour, perfect for hand creams and body lotions, great for shampoos, hand washes, conditioners, serums etc. 24mm standard white plastic lotion head also available.